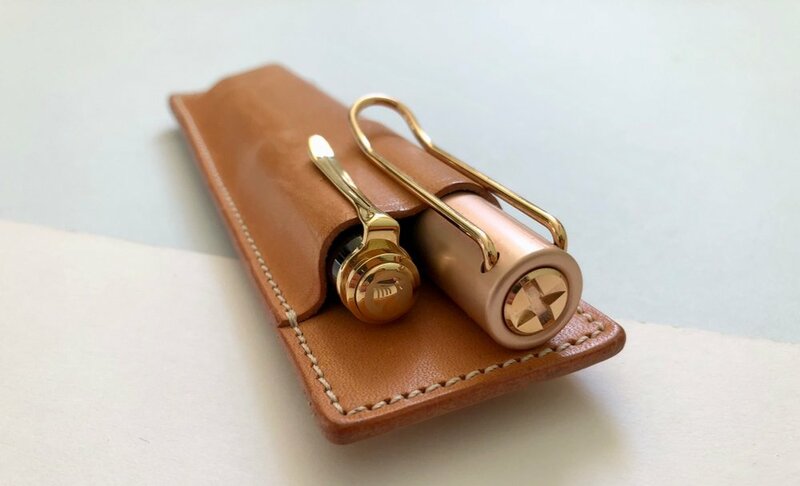 Mid-Week Mini: Baum Kuchen x Superior Labor Leather Pen Holder. I bought the Baum Kuchen x Superior Labor leather pen holder on a whim. I was in the process of buying a few other items from Baum Kuchen and I thought this pen holder was pretty, but also would be a useful when I need to carry around a couple of pens. The pen holder comes in a natural, undyed leather. It is a 2 pen sleeve with stitched detailing and a brass clip on the reverse side engraved with a very apt analogue quote (there is a clip-less option too). The branding is on the reverse of the pen sleeve which means everything is simple and classic in its design. I have been using my pen sleeve for about three months and the colour has changed quite a bit purely from sitting on my desk rather than being exposed to lots of sunlight. In the photo below you can see the colour in comparison to a Superior Labor portfolio in the light brown colour. The leather has moulded nicely around my fountain pens which have been faithful partners on the pen sleeve. If I were to swap these out for alternative pens, or pens without clips, the fit wouldn’t be so snug and I’d need to be careful not to lose anything. I haven’t used the clip at all. I did think I would clip this onto my Travelers Notebook but the position of the clip makes this look a little odd and is unbalanced. As I don’t move around with these items much I also don’t feel the need to clip the pen sleeve onto a notebook. You can do it and its sort of useful for moving things around but that’s about it. Superior Labor produces really nice products and this collab is the same high quality. I am surprised by how much I have used it and it’s quickly became an item that I use on a daily basis. The Nock Co Sinclair has been on my shopping list since its launch. I was attracted to the design instantly and finally decided to treat myself before Christmas picking one up from Pocket Notebooks. Exterior of the Sinclair with a very useful double zip. The Sinclair is a double zip case with space for three pens or shorter pencils, a few pocket notebooks and a small side pocket for loose papers. The double zip is really sturdy and never catches. It goes halfway down the pen case which means you can easily see and get to everything inside. I opted for the coffee and amethyst colour way which is beautiful. The coffee coloured exterior is a really nice dark brown which doesn’t show up any scuffs or dirt. The amethyst interior adds a lovely pop of colour and makes it easy to see everything you have inside. The combination of colours works well together. I have two pens, the Baron Fig Key Squire and the Zebra Sarasa Clip, and two short pencils sitting in one slot together. The pen slots are a good width giving you plenty of space and protection to the contents inside. In the side pocket I have the Field Notes annual calendar that came with the Resolution edition. I find it really useful having this with me and it sits perfectly in this pocket. Sitting in the main section of the pen case I am currently carrying one Resolution edition Field Notes which is simply a to-do list and a Shenandoah Field Notes which is for general notes. My filled Sinclair case. I can squeeze in another notebook too. One big reason I really like this pen case is that it holds everything I need to carry around with me. It’s the one thing that has made me use the Nock Co Sinclair everyday and why I haven’t been using my pocket notebook leather covers. The pens I need and use regularly are always with me and my notebooks now. This is by far my favourite Nock Co pen case that I own, and I have several. I love the colour way and durability of Nock Co products and having everything I need for note taking in one place is handy, its that simple. Baron Fig sent me their latest limited edition Squire pen, The Insightful Spectre to review on the blog. I have been using this pen since its launch and have thoughts to share with you, however to be clear, all opinions expressed in this review are my own. 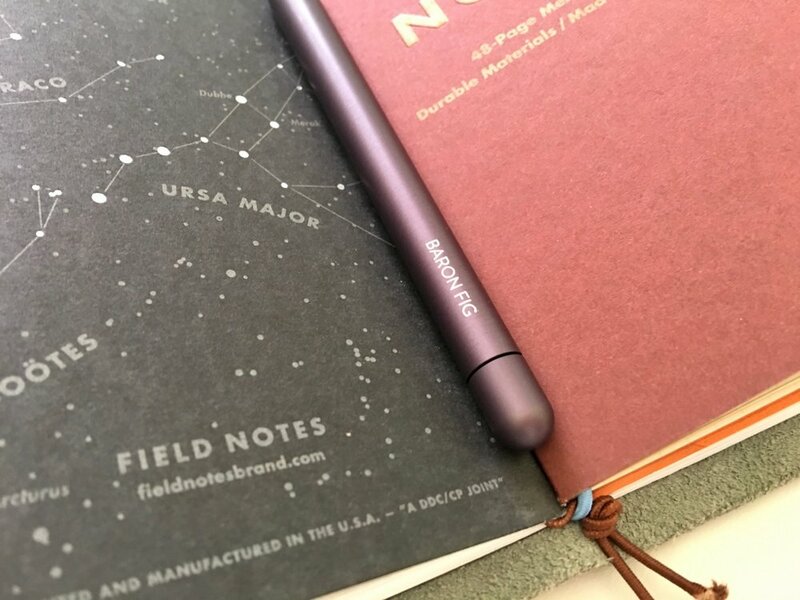 The Insightful Spectre is the latest limited edition release in the Baron Fig Squire line-up. It’s actually my first experience with a Squire pen. The Squire is a very simple aluminium pen design that tapers out slightly towards the pen tip fattening up so that the pen stays in your hand when writing and stops slipping. There is no cap or knock on this pen, the refill is exposed through a twist mechanism. All of this helps keep the Squire aesthetic very simple. The limited edition features of The Insightful Spectres are the dark, foggy barrel colour. In person The Insightful Spectre appears a deep purple / grey colour. I was expecting it to be darker, almost black because of how it appears on Baron Figs website but it’s nothing like that, the real colour was a nice surprise. It adds a bit of interest. Baron Figs branding appears on the barrel in a contrasting white. On the other side of the barrel is the very cute ghost that makes up part of The Insightful Spectre story. The ghost has white eyes that really pop on the pen, almost like he's watching you. I have been using my Squire for NaNoWriMo to the point where I have used the entire refill. I have found when using this for long periods of time that the weight of the pen becomes a little heavy. I don’t think this is perhaps an issue with the pens design, it’s the aluminium that makes it uncomfortable. Because of this I don’t recommend using the Squire for writing for long stretches of continuous writing. It is however great for short note taking, journaling and everyday use. The ideal pen for note taking? The refill that comes with The Insightful Spectre is very good. It takes the Schmidt P8127 which is a popular pen refill. This limited edition release came with a fine black refill which is perfect. The line width is not too thin and scratchy but not obnoxiously wide either. The black ink is deep and dark, not a wussy black ink. The refill doesn’t let this pen down. A comparison against something black, plus I like this photo. I have really enjoyed using The Insightful Spectre over the past month. It’s a well designed pen made from materials that make this a durable pen. There is no fear when using it on the move, or when small people try and steal your writing tools. I would like to thank Baron Fig for sending me The Insightful Spectre to review on the blog. This post represents a first here at The Finer Point. I will be collaborating on a two part review with Priya from The London Parchment on a stationery item we both have a shared affinity for, the Hightide pen roll. I have been using the Hightide pen roll for a short period of time and will kick off the review collaboration with my thoughts after a few weeks of use. In Part 2 Priya will share a more detailed, long term review over at The London Parchment. We hope you enjoy this joint review collaboration and find our thoughts helpful. Why the Hightide pen roll? Priya is the reason I bought the Hightide pen roll. I decided had to have this pen roll after reading her interview with Pocket Notebooks and was immediately drawn to it in part because of the vibrant yellow, but also because I had been intrigued by pen rolls for some time. To me a pen roll suggested creativity and made me think of an artist with a pen roll full of pencils, drawing pens and brushes. It is totally a romanticised view of a stationery tool but it’s the image that has always been conjured in my mind. I had in the past, and still do, love the look of The Superior Labor Leather Carrier, however as this is leather it was a tad expensive and hard to come by in the UK. After seeing the Hightide pen roll in Priya’s interview I immediately wanted to find out more about it, which proved tricky as reviews are limited. There are a couple of online retailers here in the UK where you can pick one of these up for a very reasonable £10 so the risk of buying it and not enjoying it was minimal. After using the pen roll for a little while now there are some things that I really like. Firstly the Hightide pen roll is a piece of canvas material that adapts in size based on what you're carrying. The pen roll is one large pouch secured with a natural leather strap. You can really stuff this thing full of pens and pencils and it will grow with you, or you can just have a minimal carry. The leather strap is a simple addition to the design whilst working really well on keeping its contents safely in place. I love the bold colour options and design of the pen roll. Personally the bright, vibrant yellow was the pen roll for me however there are other options available including black, khaki, bright red, navy, plus some others. I was a little concerned that the canvas would mark and get grubby really quickly but this hasn’t been the case at all. Inside I have some pencil marks where I didn't use a pencil cap but these marks have not shown through to the outside of the case. It has also fared well with dirt and kept its vibrancy. Full disclosure, I don’t throw this in and out of a bag everyday, so this will have some part to play. But from my experience it doesn’t pick up marks and scuffs easily. The canvas can take a battering which is what you want, and expect from a pen roll that is supposed to be used on the move. Finally I really like the fact that the branding is almost non existent. There isn’t a tag or a logo printed anywhere on the case and there is nothing on the leather. In fact I cannot see Hightide branding anywhere on this pen roll. The only thing visible is ‘The Genuine Field Stationery’ tag line along with an image of a dog holding what looks like a pen roll. This is the only hint that this is a Hightide pen roll. There are a couple of downsides with the Hightide pen roll but they really are minimal and not big problems for me. The width of the pen roll makes carrying full sized pencils a challenge and is even worse if you add on a pencil cap. Blackwings need to be well used to fit in the pen roll. Even with ferrule-less pencils you cannot put a fresh, unused pencil in this pen roll. A little additional width would be welcome with the Hightide pen roll. I am aware it’s not called a pencil roll but in order to carry around a range of tools this would have been helpful. The only other con I can come up with for the Hightide pen roll is that it can be a little tricky to find what you're looking for inside. But that feels like I am cheating as it's a pen roll and what did I expect? How does this stack up against my other pen cases? I have reviewed several other pen cases and storage items here on the blog. In terms of a comparison the Hightide pen roll is very different. The format is different and its designed uses are different therefore I feel like I have found a good complimentary product. For example comparing it with the Nock Co Lookout hardly seems fair. The Lookout is designed to mainly keep your high end pens secure in a well designed case. I am not sure I would throw (m)any fountain pens in my Hightide pen roll for fear of damage or leaking and because there isn’t enough padding to protect them. Therefore the Nock Co Lookout and the Hightide pen roll actually work together serving different purposes. My Hightide pen roll has become a catch all for my gel pens, drawing pens and pencils working well with my new foray into Bullet Journaling. Comparing the pen roll to the Lihit Lab Otomo pencil case I reviewed a few months ago is where I think closer comparisons can be made. The Lihit Lab Otomo pencil case is a traditional pencil case. For me the Hightide pen roll wins the battle due to its expandability and adaptability to different tools. The Lihit Lab pen case has a smaller capacity and can only house so many pens whereas the Hightide pen roll just keeps growing the more you include. I really like my Hightide pen roll and I am really glad Priya introduced me to this pen case. I have enjoyed using and admiring it and I feel it has become one of the stationery items that will stay in use for a long time. It looks good, is functional and feels really durable. And for the low outlay cost it’s one of those little stationery gems. Don't forget to check out Part 2 of the Hightide Pen Roll Review which will features on The London Parchment to get Priya's thoughts on this pen case after six months of use.